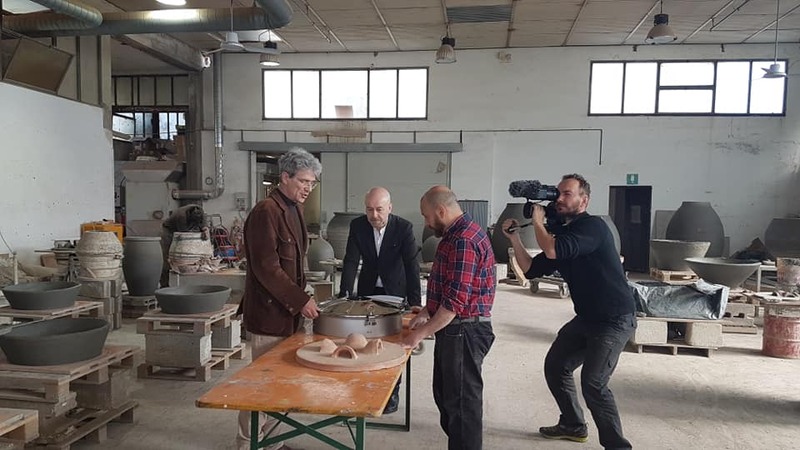 The operators of “Voyage”, the French television channel of the FOX Networks group, were in our workshop on Monday 2nd April, to film Artenova’s experience on working terracotta jars for winemaking, part of a documentary on the old Roman road “Via Cassia”. 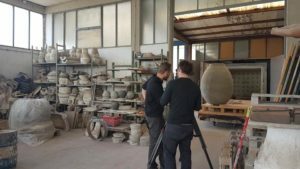 (The road passes near Impruneta) An episode of the documentary “Via Italia”, a Luna Films production, airing in December 2019 will be devoted to our company. The owner of Artenova, Leonardo Parisi was joined in his workshop by Sergio Bettini, consultant of the company and designer Pier Paolo Taddei. 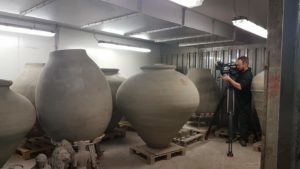 Among the topics the Filmmakers discussed with Parisi was the study of new forms for the stainless-steel caps hermetically closing the terracotta wine jars. They also captured on camera the hard work entailed in the creation of a jar. How it’s crafted entirely by hand, then taken to the drying chamber after which it is fired in the kiln at over a thousand degrees. Finally, it is taken outside to weather the elements in the Artenova courtyard, a procedure to ensure its water-tightness.